Re-read the guidelines for submission (below the graphic) so you can be sure your post matches the spirit and theme of this linky. They now read that giveaway posts are not allowed. Giveaways are frugal ways to get swag, but not practical for every day living. Thank you for understanding. Also, please remember to link your post to one of the host blogs! 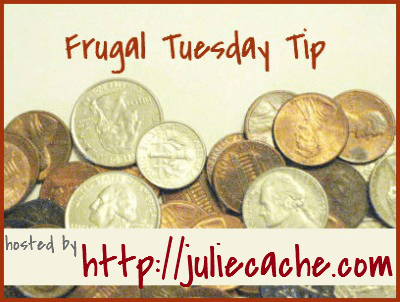 The Frugal Tuesday Tip is a weekly blog linky where participants share their frugal tips. It closes on Friday, April 13, 2012. COUPON MEETUP is scheduled for Sat., April 21, 2012 in Des Moines! RSVP with the link. I’ve got a lot of coupons to share!